Defeating cancer takes teamwork — the teamwork of doctors, researchers, patients, the V Foundation, our mission partners and you. Create a team for the Victory Ride to Cure Cancer presented by Braswell Family Farms, and invite others to join you — and us — in creating a cancer-free tomorrow. If you have not registered, click the Register Now button below and choose the START A TEAM option in the first step of the registration process. If you have already registered, email [email protected] with your team name and you can get started building your team! In addition to keeping each other accountable for achieving your goals, you and your teammates can plan team fundraising events or create a friendly inter-team competition to see who can raise the most money. Statistics show that being part of a team correlates to stronger fundraising performance. 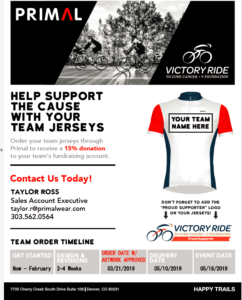 We know you’ll have a great time at the Victory Ride if you participate as an individual, but we also know you’ll have an even better time if you participate with a team. From wearing matching jerseys to swapping stories after the ride, the camaraderie of participating as part of a team will make a great experience even better. At the Victory Ride, fundraising rewards aren’t just for individuals. Teams can earn fundraising rewards, too. Any team that raises $5,000 or more (based on combined individual fundraising totals) will earn a team sign to be displayed at the event. We want the world to know about your fundraising success! Any team that raises $10,000 or more (based on combined individual fundraising totals) will earn a dedicated team tent, banner at the festival site and pair of tickets to the VIP reception featuring George Hincapie. In addition to having the ultimate bragging rights and a larger team tent to show off, there will be extra special rewards for the top fundraising team. 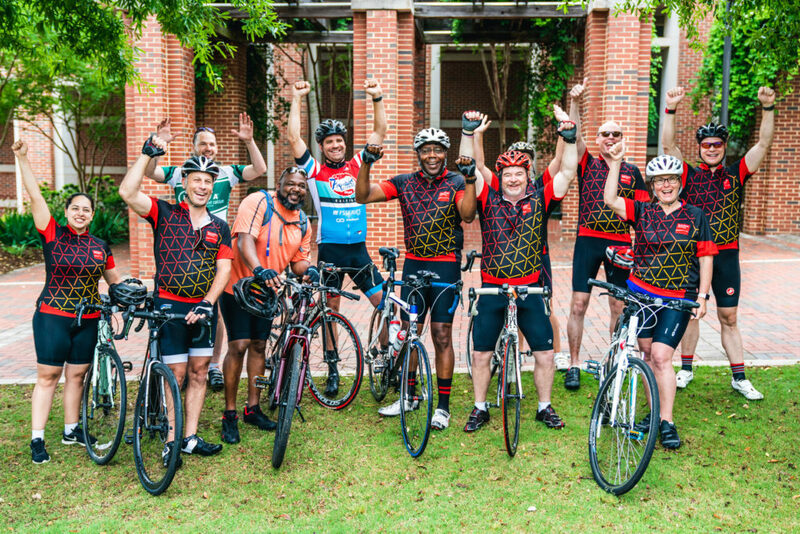 We encourage corporate teams to join us for the Victory Ride. Give back to your community while creating camaraderie in your workplace. Start your corporate team today, and help us create a cancer-free tomorrow. Email [email protected] for more information. Quick tip: Utilize your network. Ride entries can be used for employees, clients and vendors. Or donate them to your favorite charity, activity group or alma mater. 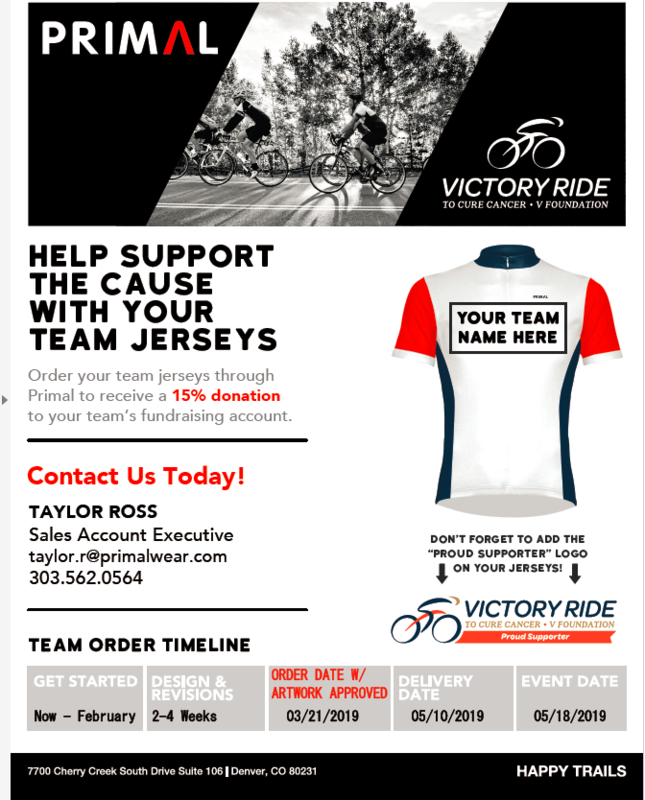 When you order your team jerseys through Primal you will receive a 15% donation to your team’s fundraising account. Click here for more information.